Another Food Mug Shot. - Welcome to The City of Desire. 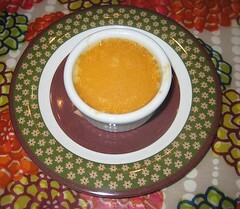 Burnt Sugar Custard from Christopher Kimball's The Kitchen Detective. It seems silly to set up reflectors and light sources to take a picture of caramel custard, but I wonder if I should consider improving my food photo setup. This Burnt Sugar Custard is another great recipe from one of my favorite cookbooks, Christopher Kimball's The Kitchen Detective. It's like creme caramel with the caramel mixed into the custard. No messy unmolding here! Interestingly enough, the recipe calls for you to serve the custard warm or at room temperature. Cooking Note: If you're making custard and notice that there are some little bits of egg white or yolk that you can't seem to beat smooth, pour the liquid custard through a fine mesh strainer and into another bowl before distributing it into ramekins. That's what they make those strainers for. I managed to clean that off with hot water, thank God. I was afraid that we'd permanently damaged the cooktop with that stuff.